Advanced Micro- and Nanomaterials for Photovoltaics shows how novel materials and technologies are being used in photovoltaics at the micro– and nano–scale to improve performance, while also reducing costs. In particular, photon converters, oxide solar cells, DASH silicon solar cells, new forms of silicon (e.g. silicon clathrate, thin films), hot carrier solar cells, and low-cost deposition techniques are discussed in detail. 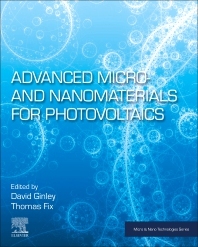 The book is intended to act as a reference for researchers, both in academia and industry, who are working in novel photovoltaic technologies, for researchers looking for innovative projects, and for anyone in the fields of materials science, physics and engineering. David Ginley is Research Fellow and the National Renewable Energy Laboratory and a Research Professor at the Colorado School of Mines, USA. His research interests are in the areas of nanotechnology and nanomaterials, transition metal oxides, and organic electronics.